Sergei Pavlovich made quick work of Marcelo Golm, putting him down with a flurry of punches punctuated by an overhand right that produced a TKO at 1:06 of Round 1 in this heavyweight slugfest. It was the first UFC win for Pavlovich (13-1), who fights out of Moscow, while Brazilian Golm falls to 6-3. Heavyweights stepping up now. Russian Sergei Pavlovich (12-1) is coming off a loss in his UFC debut, while Marcelo Golm (6-2), out of Brazil, has dropped his last two. 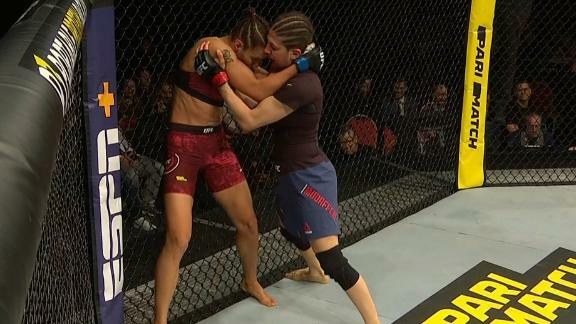 Roxanne Modafferi handed Antonina Shevchenko her first career loss with a smothering grappling display that earned her a split-decision victory in the card’s only women’s fight. Modafferi (23-15) never allowed Shevchenko (8-1) to get her striking game into rhythm, controlling the action most of the way -- at least in the eyes of two judges.